American Speedfest has never just been a race weekend; it is a no holds barred celebration of muscle, speed and extravagance drenched in American patriotism. Where can you find pageant shows, hot dog eating contests, live music and driving displays alongside mind blowing on-track action? For one weekend in June, the Kentish lands were transported stateside. America had come to the UK like never before. For the guests of Stopwatch Hospitality, they were treated to an unforgettable experience that for any motorsport fan was something truly special. People often say that the 3rd film in a series is never as good as the originals and perhaps it needs to end. Well if anything, the American Speedfest is the exception. Having been to the Speedfest for every year of its existence, from my Stetson to my boots I can tell you that it blew the other years out the water. 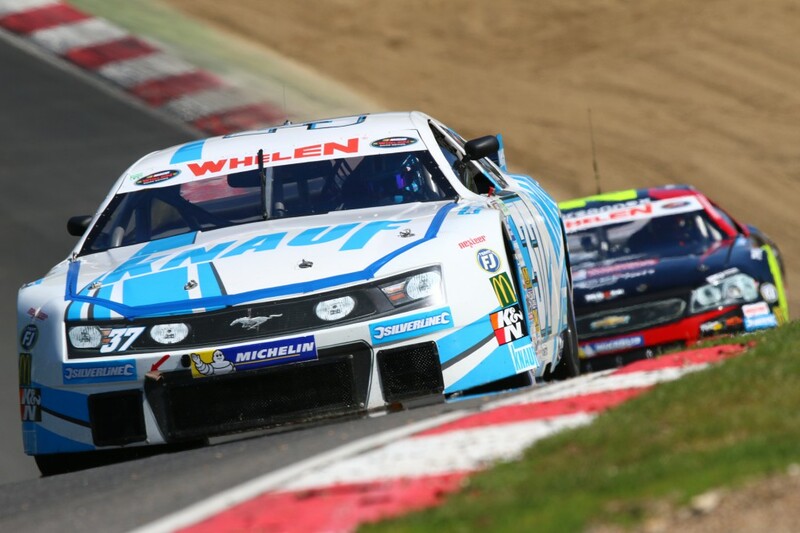 As the hugely popular event returned for its third year, the headline act remained the NASCAR Whelen Euro Series. There are many within the world who look at American racing with a certain degree of scepticism; isn’t it just a bunch of rednecks in cars turning left for a few hours? It can be safely said that the NASCAR Euro Series does blow that theory straight out the ballpark. From the fiery pits of hell comes the meteoric rage of the ages, the gods unleashed their chariots of fire to rain their thunderous chorus upon us all. For guests of Stopwatch Hospitality, it was not just NASCAR racing they got to enjoy, but a full behind-the-scenes tour of the DF1 Racing garage and even the chance to chat to one of their drivers, Christian Malcharek! It is not every day that you are up close and personal with a NASCAR machine, but Stopwatch made that possible! Topped off with a fabulous glass of prosecco for everyone, even Christian’s father Jirko Malcharek, Slovakia’s only ever F1 driver, joined the chat to regale the group with his stories of F1 testing. We even posed the ultimate question to Christian – F1 or NASCAR? Without even skipping a beat the answer was NASCAR, any day of the week. Entrance to Stopwatch also meant access to the official grid walk for the NASCAR Whelen Euro Series. Seeing the cars in their natural habitat with their commanders and crew alongside is something not many race fans will get to experience. The look of childish wonderment spread across the faces of all our guests; that primal passion for motorsport never fades. It’s with you for life. The other support races included the monstrous Formula 5000 cars, who could drown out even a Slipknot concert as well as some V8 muscle cars that were just utterly beautiful to watch. A star in both these races was the Stopwatch favourite Greg Thornton, who came up and chatted with the guests. A star of all types of historic racing, Greg is by far one of the nicest most genuine people you will ever meet, who always has time for the fans. If this man was not a driver, he would be perfect for television; his to-the-point descriptions and analysis of his races made everyone feel they were in the car with him. Genuine man. Genuine talent. Genuine race driver. But what makes the American Speedfest so special is that the racing is just one part of a fantastic jigsaw that fits together to create something which is every type of awesome. A visit from the auto-cast of Transformers and Cars were huge crowd pleasers, after all who doesn’t want to see Optimus Prime up close and personal? Combine that with iconic Hollywood car displays, an American style beauty pageant and a hot dog eating contest and there really is no reason to even go to the US. But to top it all off, crowds at the end of the day were treated to a Brands-style re-enactment of the famous scene from Back To The Future; the Doc, a chasing gang and of course the DeLorean with added pyrotechnics. If I was honest, throughout the lead up to the event I was filled with an immovable doubt; NASCAR machines at a track that isn’t an oval and full blown American pomposity? Surely this would not be that good. It takes a lot for me to say this, but I could not have been more wrong. The bombastic fanfare that greeted me would have been enough, and yet every time I took a breath more would come. 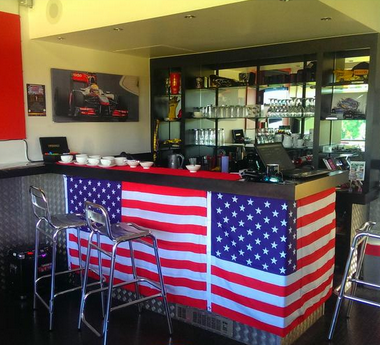 The American Speedfest has become above all else, one of the highlights of the Brands Hatch calendar every year. 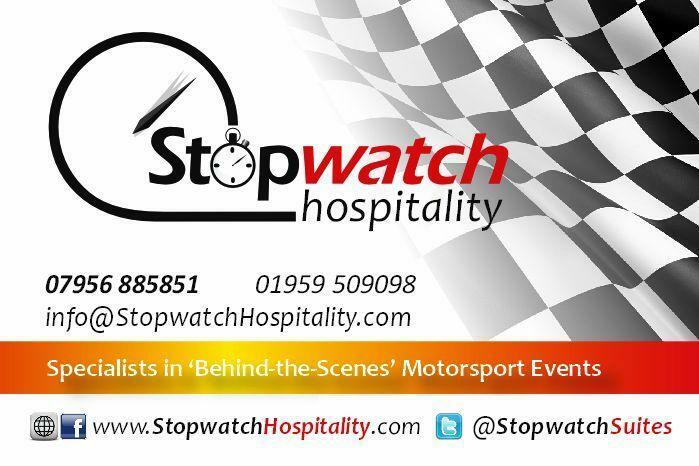 The added bonus of spending the day with Stopwatch Hospitality will give you a truly unforgettable experience, matched by no one else. Exquisite hospitality and views, multimedia access and a behind-the-scenes package gives guests a memory few others will share, a first-hand account of the full motorsport experience. It is not just what the fans see, but how the racing is seen by the teams and drivers. The only way is the USA. The only way is Speedfest. The only way is Stopwatch. Private Fleet Car Review: Subaru Forester L and S diesel. From a standing start in Drive, there’s a lag, a hesitancy, almost as if you’ve asked someone a question and they need a moment to process it before answering. With other diesels of same size and torque matched with a hydraulic ‘box, there’s more of a instant response, providing quicker acceleration and potentially a safer environment with oncoming traffic. Rolling response is also not as sharp, with little of the normal feeling of being shoved back into the driver’s seat, lacking that increasing linear, almost wave like build up. the transmissions are electronically geared, with seven rations programmed into the system and available for selection via the gear lever or flappy paddles. The diesels themselves were somewhat more chattery than expected under load. Fuel economy averaged out at just under 7.0L per 100 kilometres, coming close to equaling Subaru’s official figures (6.3L combined, 7.6L urban, 5.7L highway). The Suit. The 2016 Forester has a strong family link to the first model, with a series of evolutionary designs. Compared to the previous model, the changes are subtle but noticeable if you look for them. Subaru’s designers have avoided the high profile look of SUV’s by providing a station wagon look to the Forester family, with a lower window line into the doors, which also offers a measure of extra visibility from inside. Apart from the wheels, which were 18’s on the S, with an almost Eiffel Tower design to the spokes and clad in Bridgestone Duelers at 225/55 size and 225/60 Yokohama Geolander rubber on the L (with a simple five spoke design for the 17 inch alloys), the cars are virtually identical. The S came fitted with a sunroof (a good sized one, covering half of the roof), an electric tailgate with memory height, roof rails, single exhaust and…no rear parking sensors. That last one troubled A Wheel Thing momentarily; there is a reversing camera with lane guidance, but, as a driver trained in the day to judge distance using mirrors and to watch (in a car sales environment) others guiding movements, the decision was made that this is not an oversight but a chance for careful family oriented drivers to be a driver, not a pilot. Both cars featured non LED driving lights at each lower corner of the front bumper, flanked by black urethane that leads to the rear via the sill panels. Both cars rear windows had privacy glass fitted and had a rear window spoiler/dust deflector. On The Inside. To be honest, the interior of the S is a bit of a letdown; the L features a key start, cloth trim and manual seats, the S is keyless (push button) faux leather and electric driver’s seat, plus heating (High/Low) for both front pews. Given there’s no in between model, this may account for the lack of luxury feel for the top of the range S. There’s no other difference between the two, as plastics are the same; dour, a touch hard to the touch and eye, the same look and feel to the tiller and gear lever as well… Subaru have also chosen to stay with a cargo space design A Wheel Thing finds somewhat odd; there’s a full sized spare instead of a space saver but laid at an angle. The liftable floor terminates in a downward angled slope towards the tailgate, ideal for items that have rolled or moved in transit to fall out as soon as the ‘gate is opened….Cargo space is good at 474 litres with the rear seats up, which increases to 1474 with them laid flat. Also, the Forester diesel autos don’t come with the award winning Eyesight system, a curious decision. What they do get is the Starlink navitainment system, the simple yet utterly effective ergonomics for the aircon and the clean look to the dash, plus both get the lockable centre diff for off road shenanigans. On The Road. The L felt softer in the ride than the S; it’d be hard to say the slightly higher profile tyres would have had much of an impact, so possibly a different suspension tune or slightly lower tyre pressure would account. Both cars gripped in the tight roundabouts, off camber turns and sweepers equally, with a touch of squeal from the Yokohamas occasionally. As they’re identical mechanically, the drive was the same, steering and brake feedback the same and headlights at night gave a good spread across the road. Consequently, they both offer a competent package, torque sapping CVT aside. The Wrap. They’re both nice cars to have but depending on your feelings about CVT versus traditional autos, the driveability may be a sticking point. Otherwise, fit and finish, the feature list for each and, of course, the massive options list available, plus a good price point (range starts at around $29K) should have them high on the “To Check Out” list. Head to www.subaru.com.au for the range plus pricing and download the brochure. The Car. Subaru Forester L and S.
Transmission: Constant Variable Transmission (CVT). Power/Torque: 108 kW/350 Nm @ 3600/1600-2400 rpm. Consumption: (claimed) 6.4L/7.6L/5.7L per 100 kilometres (combined/urban/highway). Dimensions: 4595 x 1795 x 1735 (L x W x H in mm). Wheelbase: 2640 mm. Weight: 1627 kg. My teenage son got his provisional licence last week. I guess that most parents in this situation will have a mixture of emotions: relief (no more having to sit in the passenger seat! no more Mum’s taxi duty! ), worry (I’ve read the stats on young male drivers…), wistfulness (my little baby boy is all grown up) and pride (hasn’t he done well!). I had expected that I would be a lot more worried the first time he drove solo (out to his uncle’s place for dinner and to drop off some furniture). When it actually happened, I was more worried that he was going to not tie the furniture onto the deck of the old ute properly and have it fall onto the road. Which brings me neatly to one thing that the parents of P-platers need to remember: P-platers are still learning. They may be able to drive solo, saving you some of the hassle of running them about, but they still have got a lot to learn. My son still needs a few lessons in tying loads onto the deck of a ute or a trailer (it’s part of driving in daily life, after all), and in driving in snowy or icy conditions, for example. 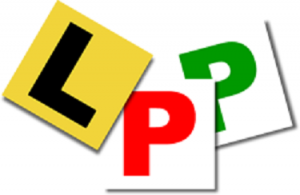 Your P-plater may need other advanced level lessons to sharpen up their skills. Admittedly, some of the things they need to learn while on their P-plates are only going to be learned through experience. They need to learn to take responsibility for their actions even when Mum/Dad/the cops aren’t looking. They need to develop enough backbone to leave band practice on time to they don’t break the curfew. And if they mess up, they need to do something to pay for any repairs or fines. If they don’t have a job and you have to foot the bill, then extra work should be done around the home to help you in return for this. You shouldn’t cover their butts and take all the consequences for them. 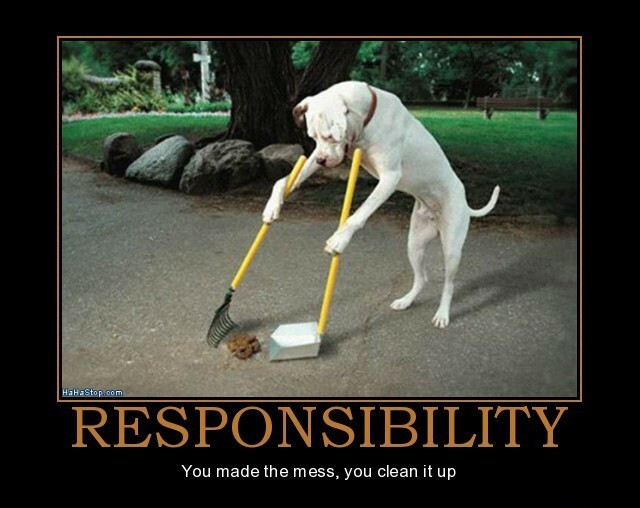 With privilege comes responsibility, after all. Having a P-plater in the family does bring a shift in the dynamics. There are new rules and possibly new routines to be sorted out. During the inevitable negotiations, remember that you are the real grown-up and you are still in charge! It’s your name on the ownership papers of the car, after all, so you do get the final say. What activities can and can’t your P-plater take your car to? For example, we have the rule that my son can take the car to band practice, to jobs and to church activities, but not to school, as there’s a perfectly good school bus that our taxes pay the petrol for… except on the days when his little sister has gym practice and he can drive himself and her to school as long as he takes her to gym (Big Brother’s taxi instead of Mum’s taxi). Rule two is that if we’re all going to the same place, we all go in the one car and don’t take two cars per family. You will probably have your own set of activities and rules. If you have more than one car, are certain cars off-limits to your P-plater? This may be for insurance purposes or for safety purposes or both. In our family, my son can drive the old Nissan Navara ute solo but not my Volvo. This may come as a surprise to some who know about the almost legendary safety standards of Volvos. However, the old Nissan ute is a manual with column change and a small diesel engine that can tow trailers well but isn’t particularly speedy. The Volvo, however, is an automatic and has the tendency to creep up over the speed limit, as it doesn’t have cruise control. Fast automatic car + young male driver = trouble. How will your P-plater contribute towards the upkeep of the vehicle? Not all P-platers have jobs. If your P-plater has a job, then it’s reasonable to expect some contribution towards petrol money, especially if he/she takes the car to get to the job. If your P-plater doesn’t have a job, then assistance can be made in the form of extra chores or running errands in the car. 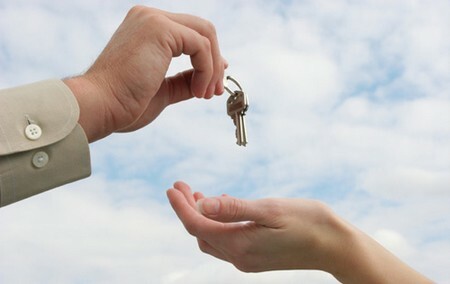 Above all, remember that it’s your car and that you control the car keys. Use of your vehicle by someone else is a privilege, not a right. P.S. The furniture didn’t fall off the ute and he got back before curfew. 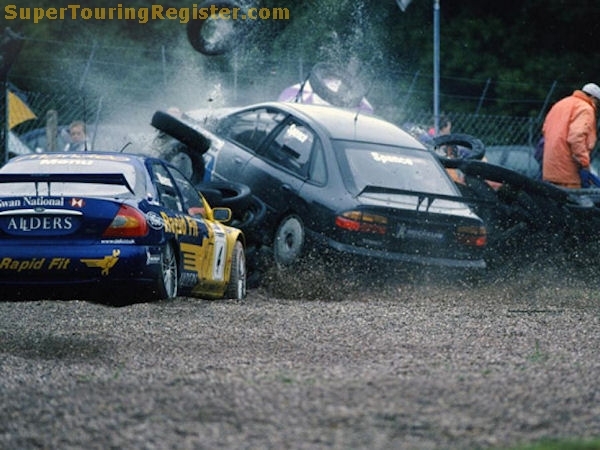 The 1999 British Touring Car Championship is remembered most fondly as both the year that Laurent Aiello won the title as well as the first time an independent won a race outright when Matt Neal stormed to victory during the first feature race of the year at Donington. Perhaps even many would remember the first ever night race in the BTCC at Snetterton where Peter Kox became the first Dutchman to win a race. However when I look back to 1999, I think of the return of a true legend who echoed what Ford did in 1993, competing in less than half of a season yet storming up the [independent] field. May I present the unsung hero of the 1999 season, the late great Mr Will Hoy. For the 1999 season, Arena Motorsport entered an ex-works Renault Laguna which would be driven by Russell Spence. It was clear from the outset however that Russell Spence lacked both the machinery and determination to challenge for the top places. In his defense however, the lead independent was the mighty Matt Neal in the Team Dynamics Nissan that started the year making mince meat of even the works cars. The other independents never really stood much of a chance. For Spence, his season may well have been defined by his huge accident during qualifying at Oulton Park at Lodge Corner; his car cut the final corner and launched over the barrier. Luckily no one was hurt. As the season headed for Snetterton and the first night race, it was announced that Will Hoy would be taking over duties in the Arena Motorsport camp for the rest of the year. 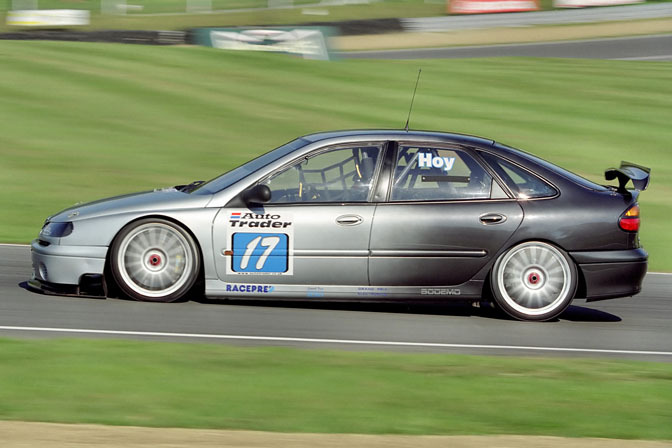 This marked Hoy’s return to racing a Renault Laguna after two years racing for the Ford Mondeo team. Hoy was never going to follow in the footsteps of Matt Neal, given the obvious lack of performance in the Arena Motorsport Renault, but it didn’t stop him driving the wheel nuts off the car for the final six rounds of the year. You are reading that correctly; Will Hoy competed in 14 rounds less than the top 2 and yet was only 52 points behind second place man Mark Blair. Taking an average of how many points Will scored per round, if he had competed in the full year he would have earned himself 283 points, which would have secured his 2nd place overall. Furthermore, this does not take into account the improvements that he would have made across the year with the consistent developments that come naturally with a full season’s racing. The highlight of Hoy’s season however came in the final race of the year at a very wet Silverstone where a titanic battle took place between Neal, Muller, Radermecker and our man Will. Lap after lap the four cars were trading places, and even though it was obvious that Hoy lacked the horse power of the other cars, he never let up until the very end. The final two races of the year saw the Renault man take a 6th and a 7th overall. Hoy was never a man to suffer in the rain, as he proved in 1998 when he won at another wet Silverstone in a Ford Mondeo that was in no way the fastest car in the field. The man was very much the living proof that motorsport is as much about talent as it is machinery. Will Hoy will always be remembered as one of the true greats of BTCC – a real gentleman and a hugely competitive racer. 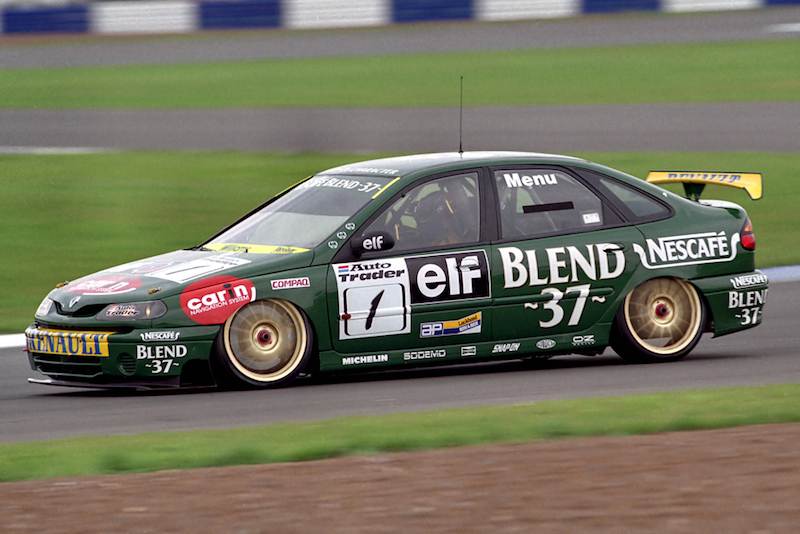 1999 proved to be his final year in the BTCC (minus two races in Class B in 2000), and what an encore it was. Here is to the unsung hero of the 1999 BTCC season, and to the true hero of the series. Will Hoy – this one’s for you. This weekend, I chose to go back to my homeland to visit my parents. 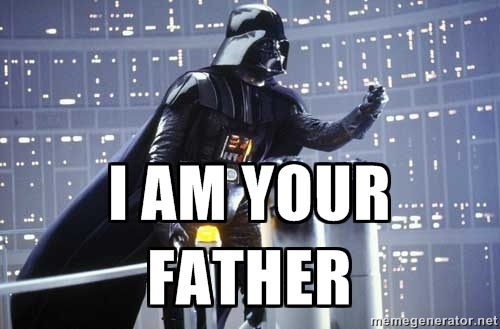 For today is Fathers Day. And as I write my dad sites atop his throne, catching up on the weekends’ motorsport. People say that some thing don’t change, this tradition has been in effect throughout my life and I can’t see this changing. While many people I know are posting wonderfully sentimental Facebook statuses with obligatory father-child photo, I thought I would take it one further. The Glynn family gene pool has been dominated by motorsport since the beginning of time. Today is the perfect day to celebrate and thank the man responsible for introducing me to the world of cars. While growing up, I never did quite fit in with those around me. Now I’m sure there are a multitude of reasons why this may be, but for me there was always one that stood out. Everyone would always be talking about football; great goals, terrible fouls and my personal favourite of referring to their team as ‘we’ as if apparently they have some say in how the team is run. For me though, all I wanted to do was talk about motorsport. Did I wish I could join in the sports chat? Not one bit. My love for all things cars can be traced back to my dad. Honestly? I could not be more thankful for it. Some of my earliest memories consist of three key aspects; my dad, motorsport and Brands Hatch. Many of my childhood weekends were spent with my dad watching all manner of racing, indulging my ever-growing passion for cars. I can recall it almost as if it was yesterday; my dad would have his race day clipboard and program, filling in all the results so he could keep a full record of the racing. It was not long until I was doing the same thing. It was around this time that my dad started telling me stories, and entrusted me with a true piece of Glynn family history. Sitting in the Paddock Hill grandstand, my dad handed to me a clipboard of my own. Covering this clipboard, in much a similar fashion to his was a blistering array of motorsport stickers of seemingly rather considerable age. This was not just any clipboard; this was his father’s clipboard. This was a ceremony, the passing on of a great institution to the next generation. My dad went on to tell me of a time when he was the child and it was his dad taking him to race weekends. I just hope that one day I can pass on the motorsport legacy to a new generation too. When it comes to cars, there are few opinions I value more than that of my dad. When I bought my first car, my dad was there. If my car breaks down, he always has the answer. If I want some advice on a race weekend or a race series, my dad always knows. Without him, I never would have discovered the BTCC. If my weekends were not spent at racetracks, then my dad and me would be watching the VHS reviews of BTCC seasons. People may wonder where my obsession with the series came from. Another point for my dad right there. When I walked through the door upon my return home this father day, the familiar scene I was presented with is what made me genuinely realise how interwoven cars are into my family. It would not be a normal day if I did not find my dad watching motorsport on the television. Without this relationship, my passion for a career in motorsport would never have been born. Just like my dad’s life is scheduled around keeping up with the latest races, mine is based around covering events and keeping the Internet up to date with my take on proceedings. All that remains for me to really say is thank you. For me, there is no motorsport without my dad. He passed his lifestyle onto me and I just hope that I can uphold this as we plough on through into the future. As I place my hands around what would have been my grandfather’s race day clipboard, it all becomes clear. By enjoying motorsport I am celebrating who I am. And where I come from. Happy Fathers Day, Dad. And thank you for everything. Private Fleet Car Review: 2015 Range Rover Evoque Dynamic. There’s SUV’s. There’s AWD. Then there’s Luxury. Brands once thought of as never going down the luxury SUV path, such as Jaguar, Bentley, even Lamborghini, have done so. Yet there’s one brand that spans luxury through to bare bones and offers a very diverse range to boot. A Wheel Thing looks at the lifestyle choice offering from Land Rover’s luxury arm, Range Rover’s Evoque, in Dynamic specification. Powersource: The vehicle supplied came with the EcoBoost turbo 2.0L petrol engine (a diesel is also available), pumping out 177 kW and 350 Nm and puts those numbers to the tarmac via a sophisticated all wheel drive system with electronic terrain selection and a nine ratio automatic transmission. It takes fuel from a 68L tank whilst motoring to 100 km in 7.6 seconds. Range Rover claim 10.3L per 100 kilometres on the urban cycle, 6.4L/100 km for the highway and 7.8L/100 km in the combined cycle. The Suit: It’s a style not to everyone’s taste, with a stocky presence; a sharp wedge shape, a bluff front end that tapers into a steeply sloping roof line that hints at a lack of interior rear seat room. There’s different front end treatments for the Evoque, with the Dynamic’s front being served a horizontal cross bar in the lower air intake, bracketed by sharply angled joiners, whilst the main grille receives the blackout treatment. LED driving lights frame the Xenon main lights, with a strong Range Rover look under the current design philosophy highlighted by an almost “Spirit of Ecstasy” profile to the head and tail light cluster design. The Dynamic Coupe is, by virtue of its name, a three door design, with two longish main entry doors and a powered rear tailgate. The doors themselves are nicely balanced, not requiring any major extra exertion to open or close. The rear door itself rises and falls at the mere touch of a rubber button on the outside, a push button in the lower plastic extremity. Rolling stock is 20 inch six spoke alloys, wrapped in 245/45 Continental tyres. There’s little give in the sidewalls, making the electronically adjustable suspension do the work. It’s a compact car, too, at 4335 mm in length, 1605 mm in height and a whopping 2090 m in total width at the front with the mirrors folded out. On The Inside:No surprises that it looks and feels sumptuous inside; from the soft touch and fabric covered dash, to the rising and rotary gear selector, from the superbly comfortable and supportive seats to the surprising amount of rear seat room. From the moment you unlock the door via the remote or touch pad on the handle, it’s luxury all the way. There’s provision for three memory positions for the leather wrapped driver’s seat, the premium look and feel of the dash, the blue backlit Range Rover logo in the door sill, complemented by the logo that shines from under the wing mirrors. The test car came fitted with the optional full length glass roof, opening up the interior to the outside world visually. The seats have a flip lever and are motored electrically in order to allow access for rear seat passengers. It’s a nice touch but no good when you’re in a hurry. The rear seat itself is configured for just two, not three, people but due to the width of the Evoque, it’s a comfortable pew, plus the seats are set deep which provides better than expected head room. Although the engine provides a nice purr, Range Rover fitted the Dynamic with a Meridian speaker system, a well known high end British company; it’s operated via the touchscreen, has numerous sound parameters and is, as expected, a full and nicely balanced sound. Below the centre dash is a hollow back panel, lit by LEDs and changeable in colour and brightness. Also, in the centre console is a set of buttons for the various off road driving options, including one called, naturally, Dynamic. When pressed, it changes the driving mood plus lights up the dash in a stark red. The profile, however, precludes seriously wide vision rearwards from the front seats; yes, there is a camera when Reverse is selected but when on the move it’s difficult to get any rear clear vision. The turbo four has gained much acclaim for its flexibility, with that torque figure and the range it’s spread over making for a easy driving experience. It’s smooth and linear with a gearbox that works. The nine speed auto does, mostly. There were some occasional clunks, indecision and hesitancy, with enough lack of smoothness in the change at times to dull the effect of that engine. Acceleration is decent by the seat of the pants feel, seeming to be quicker than the official figures, when the right pedal is given the command. It’s here the gearbox shines, with rapid, imperceptible, shifts, digging deep into the torque curve. It was more under light throttle the aforementioned issues appeared. The ride quality was, somewhat unexpectedly, a touch harder than anticipated. The size of the wheels and the rubber would certainly have contributed, however the suspension didn’t feel as if there was much “give” past a minor amount of small bump absorption. As a result, however, there’s minimal body roll, dive and squat, with road undulations reduced to a single pogo. Steering is light, responsive, communicative yet the big tyres don’t tramline, allowing the tiller to stay well within the driver’s control. On most road surfaces, too, there’s minimal external noise or tyre rumble that makes it way into the cabin. Handling wise it’s planted, no discernible understeer and thanks to that wide footprint, no provokable oversteer. Braking is well modulated on the pedal, with feedback from within the initial travel downwards of the pedal providing a positive impression; there’s bite aplenty and hauls up the Evoque confidently and without any fuss, under light braking. When the brake pedal is given the heavy foot, ABS makes itself known but not to the extent that people unfamiliar with how the pedal will pulse and the system chatters back will lift the foot…. The centre console has buttons to change the driving dynamics, through Snow, Gravel, Mud, Wet Grass etc and it works. The changes seem minor but they are effective in how the handling and overall setup of the car changes, with sensors reading the road surface conditions and adjusting the throttle and brakes as required thousands of time per second. The Wrap: Range Rover delivers on its luxury SUV promise. The Evoque Dynamic Coupe is, certainly, a lifestyle choice vehicle, in that two doors and four seats really aren’t a family orientated gear set. Price wise, at over $70K, it’s not within the “average” family sights, pricewise. There’s plenty of tech to play with, for the technologically minded and it’s got a tractable, flexible engine with a gearbox that worked near nigh perfectly and more than enough room for one or two people and their luggage. At 1640 kilos, for its size, it’s not as light as it should be and Range Rover’s official fuel figures of 10.3L per 100 kilometres for an urban cycle, however, won’t trouble the likely buyers of the Evoque Coupe. Fit and finish is of the quality one expects, from the feel of the cloth through to the sight of the gear selector rising majestically through the centre console. The driving position imbues confidence, and there’s plenty of vision forwards. Rearwards, though…..
There’s an astounding range of options available, allowing a new buyer to personalise the Evoque to within an inch of its life and that’s what a true luxury brand offers discerning buyers. The Range Rover Evoque Dynamic is not in the reach of ordinary men (and women) but those that can grasp it, it’s well worth the time spent with it. Engine: 2.0L petrol with turbocharger. Power/Torque: 110 kW/340 Nm @ 5500 rpm/1750 rpm. Economy: 10.4/6.4/7.8 (L per 100 km, urban,highway,combined). Warranty: 3 year/100,000 km with Roadside Assistance. Usually Seen: Parked in suburban driveways (but only in the better suburbs), outside the gates of private schools and near sports clubs. Occasionally spotted near chic cafés, shopping malls and hairdressers. 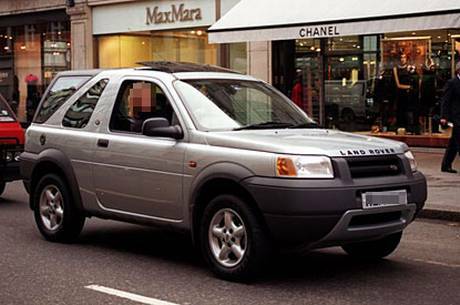 Typical Examples: Audi Q7 , Mercedes M-Class and Range Rover at the expensive end of the spectrum; Mistubishi Pajero , Hyundai Santa Fe and Ford Territory at the cheaper end. Description: For a start, we need to define an urban tractor. An urban tractor, unlike a farm tractor, doesn’t get to see much mud, unless you count mud on the bottom of soccer boots. An urban tractor lives in the suburbs and was purchased as a family vehicle for safety reasons. The idea is that bigger cars will come off better in a ding and the high position gives the driver a better view of the road… when she (usually she) is not relying on the rear parking sensors, the blind spot monitor and all the other safety gadgets. It has AWD either part time or full time, but this is because it’s safer on the road rather than because the family goes off road a lot – unless you count mounting the kerb so the kids can be dropped off as close as possible to the soccer club gate as possible. The urban tractor is usually (but not always) driven by a woman with the standard issue of 2.5 children. The children in question can be any age but are typically school aged. The urban tractor does a lot of Mum’s Taxi duty, and there’s certainly a lot of duty to be done. The taxi duty starts when Madison, Ella, Ethan or Jackson started at the Montessori preschool. Duty continued once the kiddies started at primary school and just about doubled ferrying them to all the extra-curricular activities (got to make sure that they get every possible advantage, you know): piano lessons, swimming lessons, soccer and gym, and probably after-school maths and reading coaching, too. Afterwards, the urban tractor takes Mum to work or to wherever she goes on her day off. The urban tractor may or may not contain a dog at times. Once upon a time, this would have been a Labrador; today, it is more likely to be a Cockapoo or similar designer dog (with a decent dose of poodle in the makeup because they’re hypoallergenic). The urban tractor is all about the kids and their safety. You may catch a glimpse of the kids in their Pumpkin Patch clothing when you are beside an urban tractor at the lights (best case scenario) or at an intersection, where it is a pain if you are turning and the massive urban tractor is blocking your view. They may not look back at you – they may be watching a seat-back DVD or fooling around on a tablet device. But it’s for their advantage and well-being that the urban tractor has been chosen. Mum would be driving a smart little hatchback or sleek sedan otherwise. But it is for the kids’ benefit that the urban tractor is parked on the footpath outside the after-school tutor’s premises and as close as possible to the gate. Can’t have them walking in the rain that might give them pneumonia or the sun that will burn them, can we? Unfortunately, the safety-first mentality only applies to the kids inside the vehicle itself – the ones that are the offspring (usually) of the driver. The front and rear parking sensors will help minimise the horrible potential of how a driver can’t see a seven-year-old behind or in front of the vehicle. And woe betide you if you ride a bike past the urban tractor as the doors are flung open (but Sophie’s late for ballet lessons – can’t you understand that she comes first?). 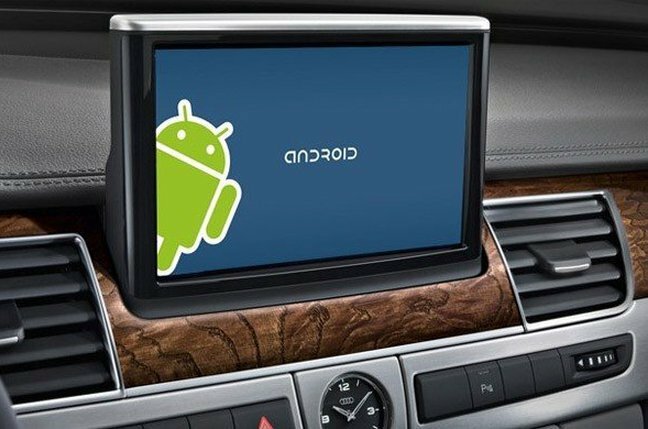 The Integrated Road: Android Auto. Technology can move at a blinding pace, bewilderingly so at times. A person born in late 1903 will have been there when the (allegedly) first powered flight by mankind took place at Kill Devil Hills, Kitty Hawk, in the US. Just under 66 years later they would have seen mankind walk upon the moon for the first time and just 12 years later, the beginning of the space shuttle era. Science fiction postulated the use of mobile communication devices, most notably in the legendary tv series, Star Trek. Motorola pioneered the use of flip phones, exactly like the communicators shown, then, in 1987, the new series showed the crew using touch style badges for communication, as well as media devices suspiciously like the tablets that are commonplace today. As seems to be the nature of business, there’s two competing brands, Apple and Microsoft. Enter a third option, in the form of the operating system known as Android. Backed by technological giant, Google, Android’s forte is being flexible, tweakable, customisable. Companies such as Samsung, LG and Sony utilise the base platform in their smartphones, themselves a device seemingly around for ever yet have been in the light for less than a decade. Now the automotive industry looks to take on the system, alongside Apple’s version called CarPlay, in a further effort to integrate technology, real and useable technology we use at home and at the office, into our cars. Android Auto uses both touch screen and voice activation, starting with an app that’s downloaded to a car’s built in navigation and entertainment system. A smart phone with Android is then connected. The catch is this, at the moment: it needs to be the Android 5.0 OS in order for the system to work. 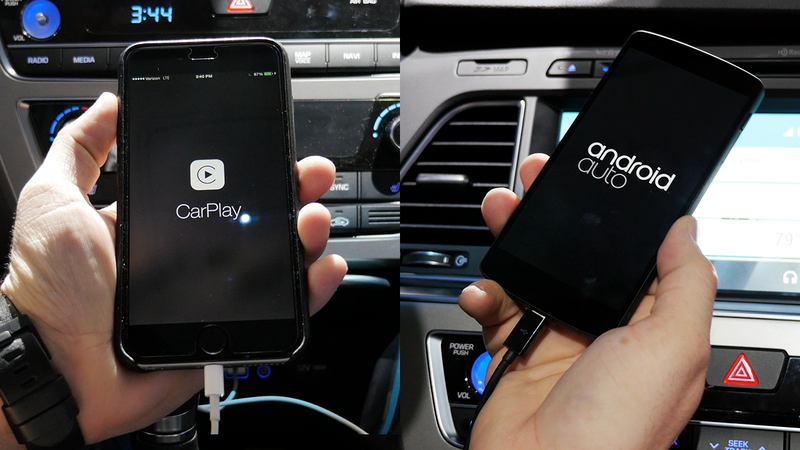 But if you’re familiar with Android then the Android Auto will fall to hand just as easily in usage. Of note is the change in navigation; the setup uses Google Maps and integrates voice activated controls and direction requests. There may also be lane guidance, traffic updates and more. Then there’s the music app, allowing streaming of music, access to your own music library and music from Google Play Music. The voice activation service has been reported as almost flawless; users have said that the system is quick, responds to almost every word spoken without issue and provides a safer level of control by using vocal rather than touchscreen inputs. Holden already has plans to provide the service as does Hyundai. Apple also has their version, Apple Play, waiting in the wings, however at the time of writing it’s unclear as to what that service will deliver. Usually Seen: Late on Friday and Saturday nights, either on long straight stretches near urban areas but not quite in them or near traffic lights. They tend to vanish when cops are spotted on the horizon, leaving unpleasant oil slicks and tyre tracks. Typical Examples: Mazda RX-something, Toyota Levin, Nissan Skyline, Subaru WRX . The boy racer car may be based on a small, cheap Japanese (or other Asian) vehicle but it certainly doesn’t look like one… until you look more closely. What makes a boy racer car a boy racer car is all the after-market additions. The boy racer car very blatantly tries to prove the manhood of the driver. Subtle, it is not. A large spoiler is an absolute must – the bigger, the better. Two spoilers are even better. The second must-have for the well-dressed boy racer car is the big-bore exhaust. Take a look at the size of both, the shape of the exhaust and the angle of that spoiler, and you’ll start to believe everything that Freud ever wrote about phallic symbols and probably compensation into the bargain. 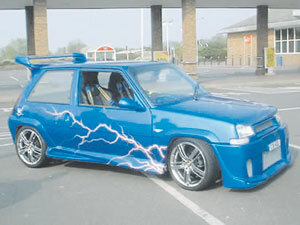 Other key characteristics of the boy racer car are less phallic but are still very exhibitionistic. No boy racer car would be complete without the sound system. These should make the car vibrate when the doors closed. If the doors and/or windows are open (or, depending on the car, the top is down), you should be able to hear the vehicle from at least two streets away. Don’t bother trying to identify what is playing: all you will hear is the very, very distorted bass. In the case of dubstep, that’s all there is to hear, anyway. Everything else is indistinguishable from the sound of the exhaust but, unfortunately, doesn’t drown out what the passengers and/or driver are shouting out the windows. Mag wheels are another must. But not just plain aluminium alloys! These ought to be colourful as well as shiny. Blue, orange, red and yellow are all possibilities. If you look very closely at some mag wheels, you may find that they are actually clip-on jobs from the local car supplies shop. But they have to be shiny. Shiny is the name of the game. The boy racer car is low slung – they ride as low as the pants of the drivers did a few years back, but at least the car doesn’t give a glimpse of lurid boxer shorts. This can be done by fiddling with the suspension and shocks, or with a lot of body kit. Preferably both. It should just skim the ground, leaving the barest little gap to allow tiny pebbles on the road to pass underneath. If the car encounters something larger than a pebble, then all that fibreglass is in serious trouble. Decals and paint jobs are often seen on boy racer cars, although sometimes you wish that you hadn’t seen them, as they are usually excruciatingly lurid. The go-faster racing stripes are the more tasteful versions. At the other end of the spectrum, you get the iridescent paint jobs and the swirly, streaky things that look like tattoos along the sides. The paint jobs usually look like they’ve taken peacocks or hummingbirds as inspiration after a decent dose of something illegal. But they don’t come in pink. If they come in pink, it’s probably a girl racer. This colour is enhanced at night-time by LED lights around the wheels, preferably in blue. It is hard to see into the interior of a boy racer car to find out what it is like inside. This is because the windows have been seriously tinted. If the windows are down, the driver and his passengers are probably half hanging out of them, blocking any view of what’s inside. We suspect bucket seats if the owner’s budget stretches that far and possibly a prosthetic cover for the steering wheel to make it look sportier. We also suspect old cans of Red Bull, V or Monster will be found sprinkled in around the interior, plus greasy fast food wrappers. More than this is unknown – even as a teenage girl, I had more sense than to get anywhere near one of these cars. The irony with a boy racer car is that once you get past the exterior and look at actual specs, all the bravado and body kit can be seen for what it is. Underneath all those modifications, even with a bonnet blower (another phallic symbol? ), it’s still a cheap little hatch or sedan with a teeny engine, but one that’s lost all its self-respect. A decent European sedan – or even another car of the same marque with a better engine that’s actually been properly serviced by a responsible owner who doesn’t thrash it to death – will leave it for dead at the traffic lights. Ditto if the road is the slightest bit worn or uneven. And girls aren’t irresistibly attracted to them. Loud noises, bright colours and big tails may work for peacocks and birds of paradise but not for human beings with half a brain cell. Turbo technology has come a long way for passenger cars since SAAB popularised them back in the 1970s. Once fraught with danger, either by revving too high or having fragile components explode, they’re now safe, reliable, more fuel efficient and make driving safer and easier. However, there’s still a stigma attached to turbo charged engined cars, to the point that governments in Australia ban drivers of certain ages from driving them. Ian Luff, owner of Sydney based Drive To Survive, appears to not entirely agree. Drive To Survive promotes driver training and promotes safety but not merely through buckling up. A Wheel Thing undertook a day’s further education in Drive to Survive’s Performance Driving course and took Hyundai’s new Sonata Premium (with a turbo engine) along for the ride. The Sonata Premium sits at the top of the revamped (formerly i45) range; behind the bluff, upright nose, looking very much like bigger sibling Genesis, is a two litre power plant, complete with a very usable 350 Newton metres of torque, spread across a range of revs, from 1400 through to 4000. Peak power is 180 kW, requiring 6000 revs to do so. It’s the torque, of course, that makes the Sonata such an easy going car to live with and such an easy car to drive. Ideal, in fact, for the Performance Driving course. It’s a six speed auto in the Premium (in fact, there’s no manual option available in the Sonata range….) and bigger brake discs to add extra stopping power (320mm by 28mm), MacPherson struts at the front and a multi-link independent rear with both ends getting amplitude selective dampers. They provide a firm, almost sporting ride yet lose no comfort for the occupants. This was important in the first stanza of the Performance Driving course, with a quick right/left slalom before jumping on the anchors to deliberately activate the ABS. Noticeable was the activation of the hazard lights, a European fixture slowly making its way through into other brands. Sonata is a big car; classified as a medium car solely because of its engine, it comes in at 4855 mm long, with a 2805 mm wheelbase. There’s a slightly narrower track (distance between left and right wheels) front and rear compared to the Active an Elite, at 1597/1604 mm (front/rear) compared to 1602/1609 mm due to the meatier rubber fitted to the 18 inch alloys. They’re 235/45 instead of 215/55 and proved to be a conversation piece later in the course. It stands at 1475 mm and is broad at 1865 mm, offering 1470 mm of shoulder room for the front seat and 1435 for the rear. Being, effectively, a revamped i45, the profile is almost identical, down to retaining the chrome strips in the front fenders. A redesigned front clip brings the Sonata more into the family look, includes LED driving lights and turning lamps whilst the rear lights cop a mild makeover. The second part of the course involved a more dynamic use of the car; tight turns (which the 2.78 turns lock to lock steering loved), ABS braking and appropriate braking into turns was the aim. Luff believes that a lot of crashes happen because people look no further than the end of the car’s bonnet. By not watching what traffic is doing ahead of you, you become almost immune to reading the road and being able to judge what is required for your driving style. Also, arm position is important, as if they’re in the wrong position should a steering wheel airbag deploy, there’s a better than even chance severe injury can occur. The course also shows that better driving comes from looking ahead, look to where the car needs to be in the very short term future, due to the speed and ability of the car working with (or against) the ability of a driver to calculate where they want to be. If you look only to the end of the bonnet, by the time you look to where you need to be, you’re already there. Look further ahead in order to be able to deal with the situation. Luff is a firm believer in technology being used to work for us, not the other way around. He peppers his delivery with an occasional reference to statistics, interspersed with adult style conversation. He pulls no punches in his presentation, as he shouldn’t, having worked with a number of Australian racing drivers including Mark Webber. Drive To Survive uses Hyundai cars for their work, as Luff also feels they are the best cars, for the money and with the level of safety features, such as the aforementioned ABS. This is an important part of the course, as statistics show that many people have never experienced a full ABS stop and therefore, when they do, think there’s an issue with the braking system and lift their foot…….the result is a crash. The Sonata Premium comes fully loaded with all electronic driving aids and safety packages, both passive and active. There’s the expected stuff like Traction Control, Brake Distribution, Vehicle Stability Management then the somewhat unexpected such as Hill Start Assist Control. There’s a full array of sensors for Rear Parking Assist plus the Premium gets Front Park Assist and Auto Hold built into the Electronic Parking Brake. Naturally there’s airbags galore; front, thorax, curtain, then pretensioning seatbelts all around, necessary, says Luff, as people are taught to steer a car but not necessarily to drive a car. He points out the preponderance of drivers wearing earbuds for sound, instead of utilising the Bluetooth streaming or auxiliary inputs, therefore the driver focus isn’t on driving and being aware. The tyres on the Premium certainly hand a driver some extra ability for most normal driving situations but the question was raised about tyre pressure. Important, says Drive To Survive, to monitor, as under and over inflation can affect the driving style of a car in a negative sense. In the tighter parts of the tracks laid out and emphasising just how fine a line it is between control and not having it, the Sonata’s handling became that of understeer, with the tyres flexing on the sidewall and “scrubbing under”. The point here, says Luff, is that coming in “too hot” to a turn will have most cars understeering, hence the emphasis on the braking aspect of the course. The Sonata has a superb ride quality but perhaps a little tuned in tyre pressure towards a softer aspect. There’s no doubt the Sonata Premium is a cosseting place to be, whether on the road or in a driver education course. Leather seats with heating AND cooling, two position memory for the driver, dual zone climate control, a cleaner and classier looking console layout than the Active, LED interior lights, rain sensing wipers and a steering column fitted for reach and rake. The audio was superb and having a bigger touchscreen than the Active (8 inches versus 4.3) made that more enjoyable as did having a full length glass roof. An old style touch for the rear seat passengers came in the form of manual (but hugely effective) curtains. Also, by buying the Premium, you’ll get three years free map updates to the navigation system. The final part of the course tests what has been imparted during the day. A longer, tighter, twistier course combined with some acceleration straights has the Sonata largely unmoved, such is the composure of the chassis. The tyre pressures again came into question; what wasn’t questioned was the sheer ability of the Sonata’s turbo engine and transmission. On the shorter “tracks” the gearbox was told to be in manual mode, as the length of the sections would see second gear and that was it. Seat of the pants tells zero to one hundred kilometres per hour time is about seven seconds, Hyundai don’t appear to officially quote one. What they do quote is fuel economy; a combined figure of 9.2L per 100 km, with highway and urban lobbing in at 6.7L and a shocking 13.4L respectively. Overall economy averaged out at just over ten litres per hundred from the 70L tank. Drive To Survive, in essence, is exactly what all drivers should do. Cars come with electronic aids and SRS (Supplementary Restraint System) equipment because too, too, too many choose not to. Note the usage of the word “choose”. A highlight of the course is the emphasis on the human element. Luff makes clear that cars don’t have a brain, they don’t lose control by themselves. The organic component is still the most valuable part of driving but bad drivers choose to drive badly. The Hyundai Sonata Premium is one of Hyundai’s best cars. It’s a good looker, goes hard, handles well and comes with a pretty damned good feature list. The safety features are world class, as is the fit and finish of the cabin. It also proves, beyond reasonable doubt, that a turbo engine and a bit of smart driving can go together just fine. Step up, Sonata Premium 2.0T. (That’s T for Turbo). Step up, Drive To Survive. The Car: 2016 Hyundai Sonata Premium. Engine: 2.0L petrol engine with turbocharger. Power/Torque: 180 kW/350 Nm @ 6000/1400 – 4000 rpm. Consumption (quoted litres per 100 km): 9.2L/6.7L/13.4L combined/highway/urban. Warranty: five years, unlimited kilometres. Service: Contact your Hyundai dealer to confirm.